Hello, my name is Tom Williams. I’m an artist/cartoonist based out of Columbus, Ohio. On top of self-publishing, over the years I’ve been published by various comics publishers- Oni, Dark Horse, IDW and Image. My first graphic novel No Dead Time (w/ Brian McLachlan) was also translated into Spanish. I’ve also been honored with a Howard E Day Prize (a festival prize for self-publishing.) and was nominated for a Harvey Award (w/ Chad Lambert. 2014). There are many many barriers, mostly financial, in making a go of doing comics. Promoting is mostly on the creator's dime: web, advertising and largely conventions. Conventions are a huge financial drain. Besides the table cost which ranges from $50 to $400 for a weekend. This doesn't include travel expenses which can triple that cost and honestly you'll never make that back. You might, might hit table as an unknown. I'd like to add a couple of larger shows to my tour schedule but they're cost prohibitive. 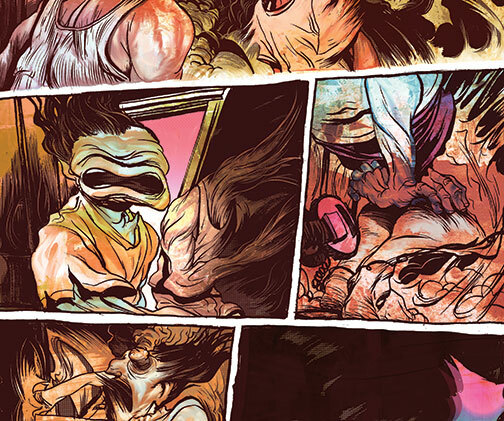 Anymore you need some kind of digital to your arsenal of comics-making. In my wildest dreams, it'd be cool to have a proper studio instead of working out of what feels like a shoe closet. It's my goal to offset this. In spite of all of this, I still love making comics. Telling stories. All of that. I'd love to do more of it. The money raised will help offset all of the above, an annoying student loan I'm still paying off and living expenses. Cost of living in Columbus is skyrocketing by the year. A bit of financial cushion would help out a lot. Softening deals gone bad which do unfortunately happen. I do have a day job but it'd be nice to either switch to part time or do the art thing full time. What you get in return is well… comics and art. I’m trying to work out how to film progress videos, but my studio is so cramped I’m not even sure how to make that happen. My dog is terrible at holding the smartphone. Damn it Henry! If the dollar amount begins to climb toward the 2nd and 3rd goal, I'll try to come up with more tiers/incentives to 'unlock'. With a monthly set up, it's hard to offer something like sketches or original art. In an effort to protect myself from scammers. An unfortunate reality with these type of sites. Would anyone want a year subscription for art prints/posters? I don't know. Prices vary depending on what you'd like but it's anywhere from $40 to $125. Marker renderings ( like Bob here) are done on a sheet of Strathamore drawing paper. Brush & ink drawings are done on a sheet of 2 ply bristol. *please keep mural requests within a tri-state area near Ohio. 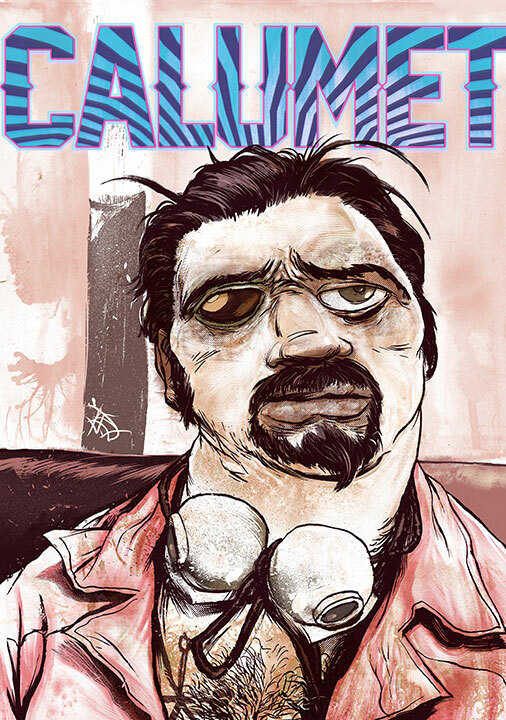 I’ll be self-publishing one to two issues of Calumet a year. What the hell is that? It’s an anthology series in the vein of Eightball. New stories both short and long. I also toss in reprinted stories that have either fallen out of print or are no longer online. Also, I’ve been working on a graphic novel concept which I hope becomes a series of books. This will also be self-published if no interested publishers bite on the book. I’m not going to elaborate on it much more other than it encompasses all my obsessions with the paranormal and conspiracy theories. SHIPPING- Since I am a one-man operation (and the dog clearly is no help) Packing and shipping rewards do take time. Please be patient and I promise to get them to you as soon as humanly possible. It would be great if I hit my top goal (of doing this full time) but I’m realistic… and have a day job. So there’s that. If you are local or coming to a show that I will be at. Give me a heads up and I will hand deliver it to you or throw it in my show tub to give to you personally. Always posting art, sketches and in progress updates on Instagram. Check out my homepage at draw.robot. Access to monthly update post and a discount code for online merch. This modest goal is simply to cover art supplies, software, web fees and other incidentals.